Providing sustainable and profitable feed processing solutions. Enegis are one of the UK’s leading suppliers of feeding equipment and specialise in agricultural and biogas applications. Find out how Enegis can help your business. – Download full product specifications (.pdf) here. – The Keltec Bale Slice removes the hassle from the way wrapped bales are fed, cutting silage, hay and straw bales with ease. – The plastic wrap and netting is removed from the bale while the bale is cut, all from the seat of your tractor or digger. – The bale slice is controlled by one double-acting hydraulic service, making it perfect for loading diet feeders, circular feeders or for use in feeding passages. – The bale slice can be fitted to any loader or tractor-mounted front loader. Enegis are proud to be the UK importer and distributor for the Vig-O-Comfort range of calf housing from Belgium. 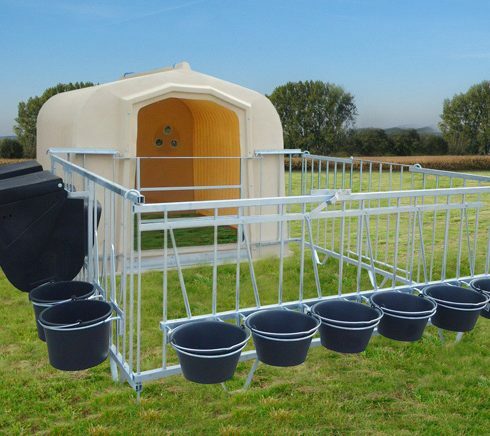 Available in three sizes, this range is exceptionally user-friendly for both calf and farmer. Enegis are market leaders in industrial and domestic agricultural feeding and housing solutions. We work with sustainability in mind, and are experts in helping your business thrive. Our products are specifically designed to cut costs and improve results in a way that also helps the environment. Yard Address: Located near Honeybourne, Evesham, Worcestershire. Please call 07721 442979 to arrange machine viewing. © Copyright 2013 - 2019, Enegis Ltd. All rights reserved.